A record 35,000 Melbournians have signed up for this year’s Run for the Kids, including a number Mosaic Myotherapy clients and close colleagues. Naturally we wish everyone participating all the best for a great day and personal best times in their chosen events. We look forward to hearing how you went. 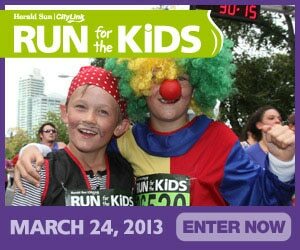 This this year’s Run for the Kids takes place this Sunday (24th March). It’s a major highlight on Melbourne’s running and fun run calendar which literally stops Melbourne in its tracks as participants run through the city’s Domain Tunnel and over the Bolte Bridge, both normally off limits to pedestrians and cyclists alike. In addition to the main (15km) course, the event also includes a shorter 5.5km course which commences at Alexandra Avenue and goes past key Melbourne landmarks including the Yarra River, Federation Square, and St Kilda Road. The event is also a major fundraiser for Melbourne’s Royal Children’s Hospital. Melbourne’s Run for the Kids is an important part of Mosaic Myotherapy’s Runner’s Rewards Program whereby all participants in Run for the Kids are automatically eligible for special benefits including savings on their myotherapy sessions. The program also enables Mosaic Myotherapy to support your team’s fundraising efforts via our sponsorship program. All you need do is present us with proof of participation when you come see us in our St Kilda rooms for a myotherapy session. The benefits start from when you first sign up for your event and continue through until one month after your race has finished. For participants in this year’s Run for the Kids, this means that you’ll be able to save on your visits with us right through until 24th April. To learn more about how Myotherapy and the range of Manual Therapy approaches to treatment we use here at Mosaic Myotherapy, eg Dry Needling, Soft Tissue Manipulation and Massage, Functional Fascial Taping, Myofascial Release, Rehabilitative Exercise etc can help you recover quickly from any post-event soreness and/or injury and/or how we can help you prepare for upcoming events, call us today on 1300 55 44 51. As we all know only too well, life doesn’t stop when the weekend starts, so Mosaic Myotherapy has recently established an After Hours Injury Service, to assist our clients when issues arise. If you feel you need to see someone after the event for assessment and/or treatment, call us on 1300 55 44 51 any day up til 9pm (weekdays and weekends too – it’s all part of the service). We’ll respond to your queries and, if needed, organise an appointment for you to be seen at the earliest possible convenient time. We’ll also provide you with preliminary clinical advice and tips to help you manage your recovery at home in the meanwhile. And of course, if we feel you’ve got an injury that needs to be seen a doctor, or that you should visit a hospital first, we’ll let you know that too.